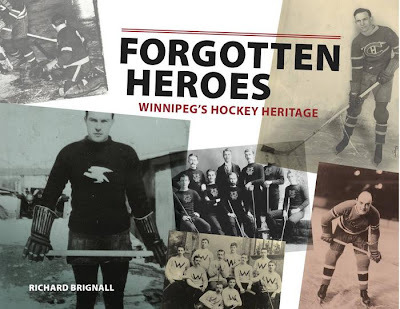 Four years ago author Richard Brignall and J. Gordon Shillingford Publishing got together and decided to make a book about hockey history in Winnipeg. They call it Forgotten Heroes: Winnipeg's Hockey Heritage . By pure dumb luck they decided to release the book in October 2011. That decision was made many weeks before the NHL announced the Atlanta Thrashers were moving to Manitoba to become the re-born Winnipeg Jets. Talk about good fortune! The Jets come back and these guys are ready to welcome them and all the hockey fans back with what promises to be a top notch book about hockey in Winnipeg. Buy The Book - Amazon.ca - Chapters - Amazon.com . And then Brignall and J. Gordon Shillingford Publishing got even more good fortune, as the highly esteemed writer Roy MacGregor boasted about the book in the Globe and Mail's front page feature about Winnipeg's proud hockey history. You can not buy that type of publicity. The Jets returning to Winnipeg certainly has all of Manitoba caught up in hockey hysteria. But it is kind of funny how the hockey fan's attention completely revolves around the NHL and the Jets. Yes they had 3 WHA championships and some memorable NHL battles. Much of their history has become all about the loss of their beloved team and now about their return. In some ways that is unfortunate as the Jets completely overshadow the province's rich hockey history. And in that sense Brignall's book Forgotten Heroes is more important than ever. You will not find much coverage of the Jets at all in this book, and that might make quick bookstore browsers dismiss the title too quickly. That would be a terrible mistake, as Forgotten Heroes is an amazing undertaking and should be mandatory reading for any hockey history fan in Canada, especially in Manitoba. 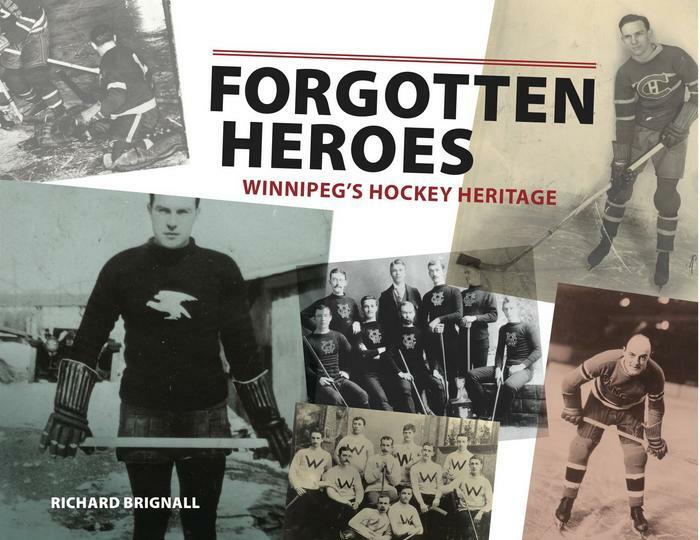 Brignall's exhaustive efforts cover 70 years of hockey history in Winnipeg. From the years of 1890 through to 1959 city teams were Stanley Cup champions, Olympic gold medalists, world champions and Allan and Memorial Cup title holders. The Winnipeg Falcons, who won Olympic gold in 1920, are famous now, but the Winnipeg Victorias, who won Stanley Cups near the turn of the 20th century, are incredibly significant to hockey history in Canada though all but ignored. All the great players in that time frame are featured prominently - from familiar NHL names like Terry Sawchuk, Andy Bathgate, and Bill Mosienko to more local legends like Legs Fraser, Zeke Ferley, and the now-celebrated Icelanders. The real old timers like Dan Bain, Tommy Dunderdale and Frank Frederickson get lots of due coverage. The book is loaded with amazing black and white photos. It is fascinating to look back at hockey in such a foreign time. The book is incredibly well researched. It is clear the author spent countless lonely hours scouring through newspaper archives to piece together the definitive history of hockey in Winnipeg from 1890 through 1959. We can only hope a follow up volume is in the works. The city of Winnipeg is rightfully celebrating it's great hockey history these days. With this book fans will learn just how rich that history is - dating back long before anyone had ever heard of Bobby Hull, Dale Hawerchuk or Teemu Selanne.